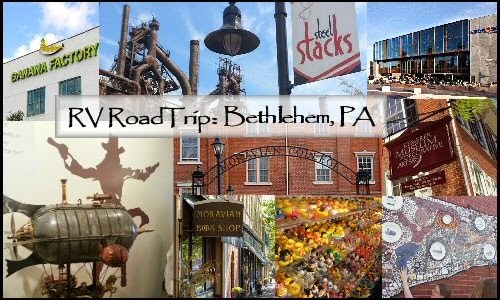 The Adventures & Travels of RoadAbode: RoadAbode RoadTrip ~ Bethlehem PA ~ More than Just "Christmas City"
RoadAbode RoadTrip ~ Bethlehem PA ~ More than Just "Christmas City"
Don't underestimate Bethlehem PA. The RoadAbode Crew was not ready for the amazing amount of diverse ways to experience this historic town along the Lehigh River. We discovered Bethlehem is a town growing into it's own as an Arts hub, rising from the ashes of what once was a booming steeltown. It's Moravian origins, the growth and demise of Bethlehem Steel, and the subsequent nurturing of the Visual and Performing Arts in this Leigh County town is something we plan on discovering more of. We stopped by what is reputed to be the oldest continually operating bookstore in the world. The Moravian Bookstore is quite inviting. It is actually four or five street front stores interconnected, including not just an interesting collection of books, but also unique gift items, a quaint cafe and a whole area within the store devoted to handmade Moravian Stars and other European inspired Christmas decorations. 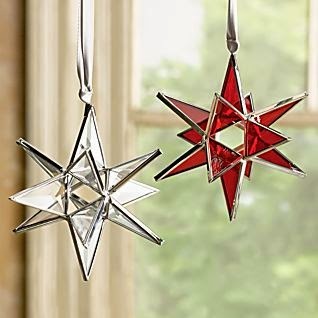 These geometric stars were adopted by the Moravian Church as a symbol of the birth of Jesus and represent the star of Bethlehem. According to tradition, a Moravian Star is hung the first Sunday of Advent and remains up until Epiphany, January 6, which is believed to when the wise men (or Magi) arrived to pay homage to Christ. The city of Bethlehem PA erects a large illuminated star that can be seen for miles during the Christmas season. During the holiday, tours of decorated historic homes, churches, and special events occur throughout it's neighborhoods, earning it the name of "Christmas City." Though the Moravian faith and traditions established the history of Bethlehem, What caused it's growth was steel. Starting in the late 1800s and throughout the 1900s, the Bethlehem Steel Company was the economic giant for the Lehigh County region. At it's height of production in the 50s and 60s, Bethlehem Steel was named the second-largest steel producer in the United States, with Pittsburgh Pennsylvania's US Steel taking top spot. The company became a major supplier of steel for both World Wars, and became one of the larges shipbuilders, producing 1,100 warships for the United States war efforts.. After approximately 140 years of metal production at the Bethlehem Steel plant, the company closed operations of its massive foundries in Bethlehem in 1996. Bankruptcy and the closure were due to combination of cheaper imported steel, rising costs supporting pensioners and lack of innovations by it's management team. Many thought the closing of Bethlehem Steel would be the death knell for the surrounding town. In 2006, Sands Casino Corporation brokered a deal that is the largest redevelopment project of a former industrialized property in the nation and the largest casino development investment made to date in the state of Pennsylvania. To date, the casino is in operation, and old steel mill buildings are being methodically revitalized as entertainment venues, restaurants, and shopping areas. Within the revitalized area is where the Banana Factory, ArtQuest and SteelStacks are located. 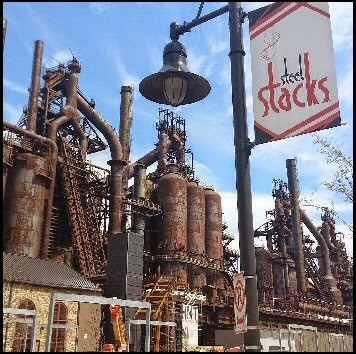 The Historic district is only a short drive, or twenty minute walk from the site of the old Bethlehem Steel site, and has experienced it's own revitalization with interesting boutiques and a nice collection of eateries. The three Art Centers we visited were The Banana Factory, SteelStacks, and encopassing ArtQuest district. We visited the Banana Factory for their Urban Art Street Festival. Various performing and visual arts were highlighted, including glass-making, photography, jewelry craft, knitting, sculpture, street dance and 3-d chalk drawing. Some artists had booths selling their crafted pieces. Food trucks and Pennsylvania brewer Yuengling provided interesting lunch options. If visiting, The Banana Factory is open to the public on "First Fridays" and has other special events through the year. Check in at www.bananafactory.org for what is going on when you visit. After enjoying our Steampunk adventure, as we walked to our car parked by the Moravian College, we passed a small festival in a park going on. It was located next to the Public Library We strolled over, and found out it was celebrating the connection with Bethlehem's sister city, Tondabayashi, Japan. There were demonstrations of Japanese culture, foods and hands-on origami folding . Was a cool little add-on to the day administered by students from Moravian College and other volunteers. Bethlehem really surprised us, from the variety of festivals, art community, historical finds, and the dining possibilities (which we didn't take advantage of this trip). We all agreed there were reasons for each of us - from teenage to fifties - to visit again! When in the Kutztown area, we usually stay at Pine Hill RV Park. It's located right next to a horse farm, and a mile down the road is the lovely Pinnacle Ridge Winery, a small local vintner with some wines we enjoy. Pine Hill is a great park, especially for older couples. We did see families here, but currently the do not have a pool, which kids love, and there is road noise since you sit a top a hill overlooking Route 78. That does not bother us "city folk" though. I love the views and have grown up with the occasional loud truck. Pine Hill has done lots of upgrades since we first visited in 2008. It's a great location for when we visit Hawk Mountain and Cabelas. It was also perfect for this trip as well. Central Bethlehem was only 30 minutes away, Allentown even closer and the RV park is only a few minutes from a shopping district. On Route 100 near where it intersects with Route 78, the Pine Hill Staff recommended we try the Starlite Diner for a meal. Glad we did - this is what a diner should be! great specials, an expansive menu, great salad and soup bar, and plenty of dessert options. Everyone in the RoadAbode Crew was full and enjoyed their meal.